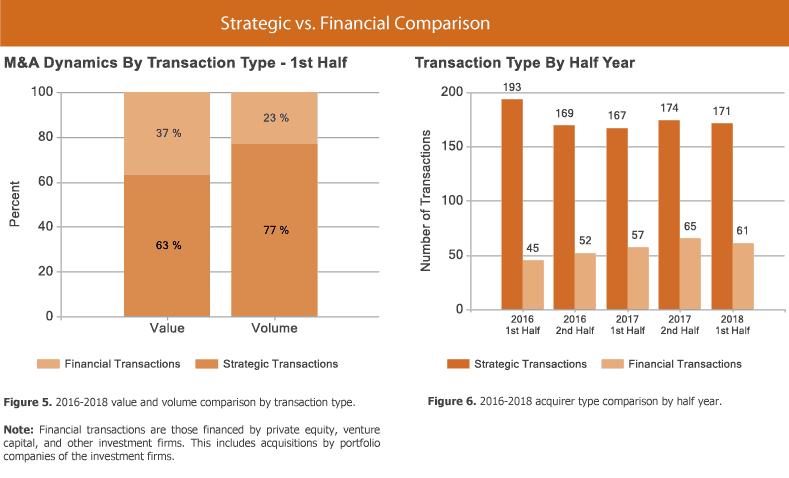 1st Half 2018 Healthcare M&A Trends Report - Berkery, Noyes & Co., LLC. The industry’s largest sponsored transaction in 1st Half 2018 was Veritas Capital-backed Verscend’s announced acquisition of Cotiviti, a provider of payment accuracy and analytics driven solutions, for $4.82 billion. Veritas Capital also completed another deal in the top ten list during the half year period with the announced acquisition of the Value-Based Care Division from GE Healthcare for $1.05 billion. 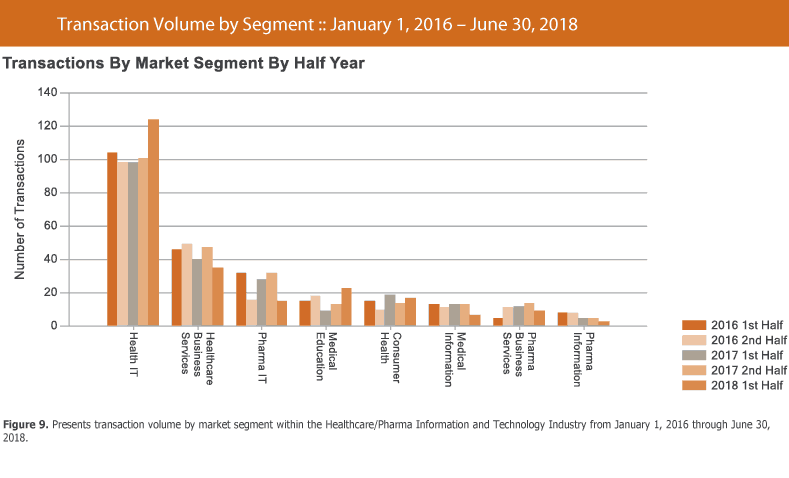 Seven of the industry’s top ten largest deals year-to-date occurred in the Healthcare IT segment. Total transaction volume in 1st Half 2018 declined by three percent over 2nd Half 2017, from 239 to 232. 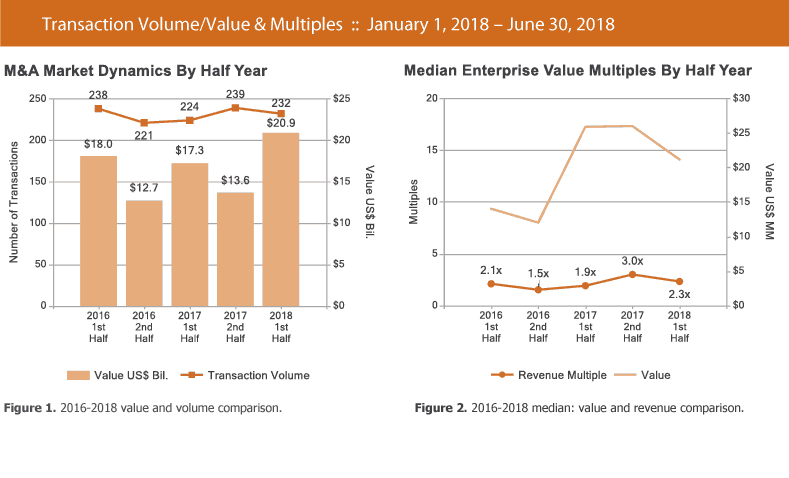 Total transaction value in 1st Half 2018 rose by 54 percent over 2nd Half 2017, from $13.63 billion to $20.93 billion. The median revenue multiple, after rising from 1.9x in 1st Half 2017 to 3.0x in 2nd Half 2017, declined to 2.3x in 1st Half 2018. During the last 30 months the median revenue multiple was 2.1x. Both the Medical Education and Healthcare IT segments saw notable increases in volume during the half year period. Medical Education volume gained 77 percent, from 13 to 23 deals. Healthcare IT volume rose 23 percent, from 101 to 124 transactions. 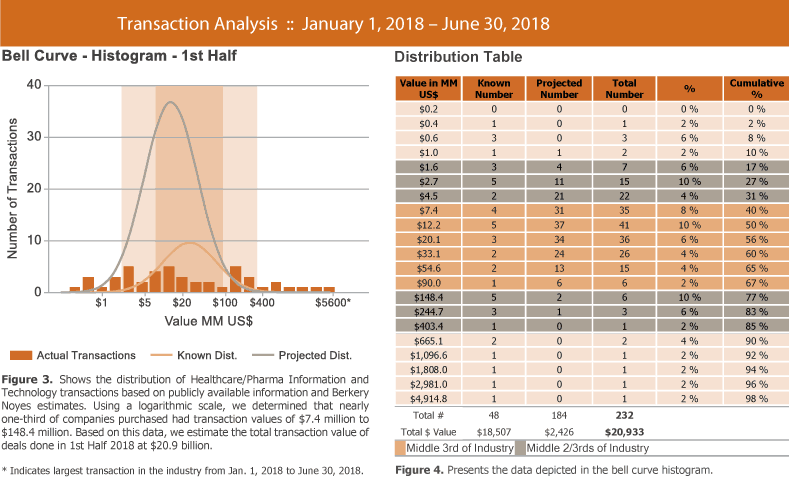 Berkery Noyes tracked 1,154 Healthcare/Pharma Information and Technology transactions between 2016 and 1st Half 2018, of which 244 disclosed financial terms, and calculated the aggregate transaction value to be $72.62 billion. Based on known transaction values, we project values of 910 undisclosed transactions to be $9.22 billion, totaling $81.83 billion worth of transactions tracked over the past two and a half years. 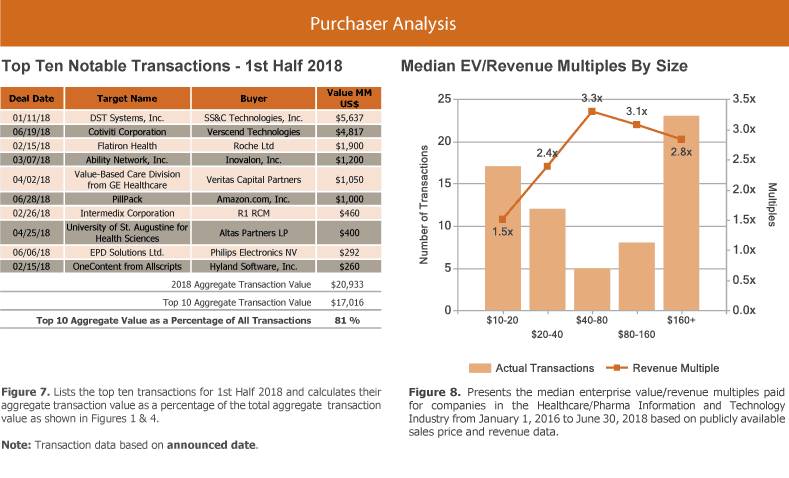 Disclosed median enterprise value multiples for all segments combined in this report during the last 30 months were 2.1x revenue and 11.7x EBITDA.